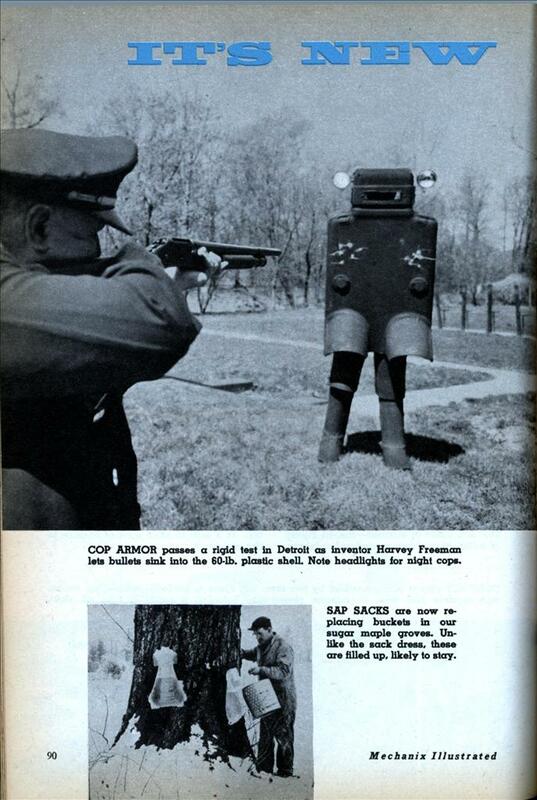 COP ARMOR passes a rigid test in Detroit as inventor Harvey Freeman lets bullets sink into the 60-lb. 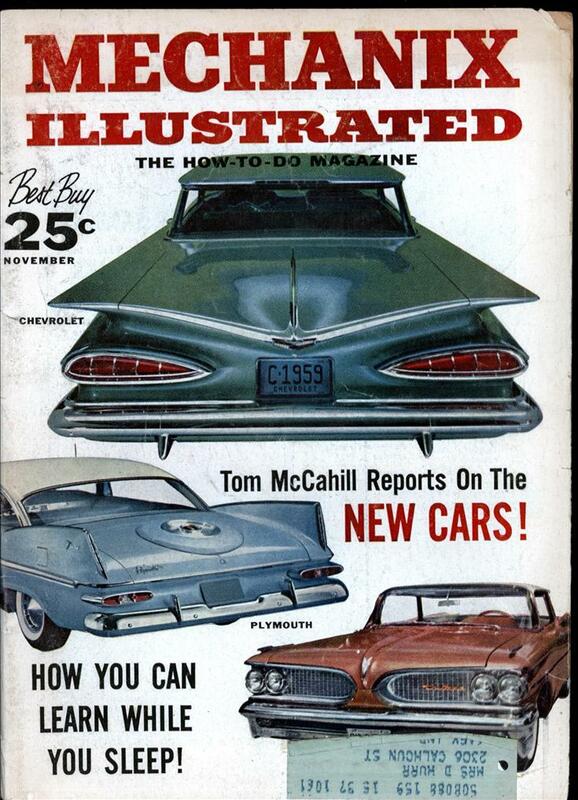 plastic shell Note headlights for night cops. SAP SACKS are now replacing buckets in our sugar maple groves. Unlike the sack dress these are filled up, likely to stay. LIGHT HOUSEKEEPING is really possible with this new Danish plastic furniture. AQUA-LITE, cousin of famous Radar-Lite, is a new underwater lamp for skin divers. TARPAULIN SPREADER, automatic, is demonstrated to officials of the Milwaukee Braves. Motor-driven spreader covers the infield in 52 seconds. TANK AHOY! Waterproofed Centurion Tank in landing exercises on the British coast looks more like a boat than a tank as it heads for the beach. SOLAR RADIO introduced recently by Hoffman Electronics Corp., Los Angeles, uses sun or artificial light or long-life, four-volt mercury battery* LONG-RANGE CHAMP is this model plane built by Kenneth A. Willard, right, of Van Nuys, Calif. RC model stayed up for five and one-half hours. BOWLER’S BLINDERS are worn to keep distractions on the other alleys from rattling him. LIGHT FLATTERY is the effect of this new glareless light bulb, according to Westinghouse engineers. The bulb is coated inside with electrostatic silica. LIFE RAFT that puts up its own canopy, provides a boarding platform that makes saving your own life easier, is a development of U. S. Rubber Co.
SATELLITE CLOCK, the latest in timepieces, has a moon minute hand circling a golden earth. INFRARED HEAT screen of plastic provides nice warmth around cribs, sun bathers on cool days and wherever a supplementary heat source is necessary. More seriously, lamps lie this didn’t last long as the crimped shells on the battery packs leaked rather badly. Also, exsposure of the battery connections to corrosion from water didn’t help things at all. Fully sealed units with O-ring seals behind the lamp body took over and were the norm for a long time. That first picture looks like a scene from a very cheap version of “The Day The Earth Stood Still”. The covered liferaft with an inflatable entrance ramp, though, has now become a standard. You owe me back two hours of my life, Mr. Reeves.